WASHINGTON (CNS) — With a diapered baby Jesus doll in her arms, the woman named Mary descended the steps and walked toward an opening marked “Bethlehem” where she put the figurine on top of a bale of straw as Franciscan friars and other priests in brown habits and white cassocks sang all around. The baby Jesus doll appeared as if it were looking above at a star next to oil lamps that dangled above its head, much like a baby crib mobile. The moment marked the commemoration of the birth of Jesus in a setting that seeks to replicate, not just the events that happened some 2,000 years ago in the Holy Land, but also the Christmas commemorations that take place in modern-day Bethlehem. But the setting is nowhere near the land of the birthplace of Jesus. Less than a mile away, the white resplendent dome of the U.S. Capitol stands tall in the Washington skyline, just about four miles from the Franciscan Monastery of the Holy Land, where the ceremony takes place. In a season full of wonky Washington cocktail parties, the Franciscans aim instead for a more modest and spiritually meaningful way to mark the birth of Jesus. 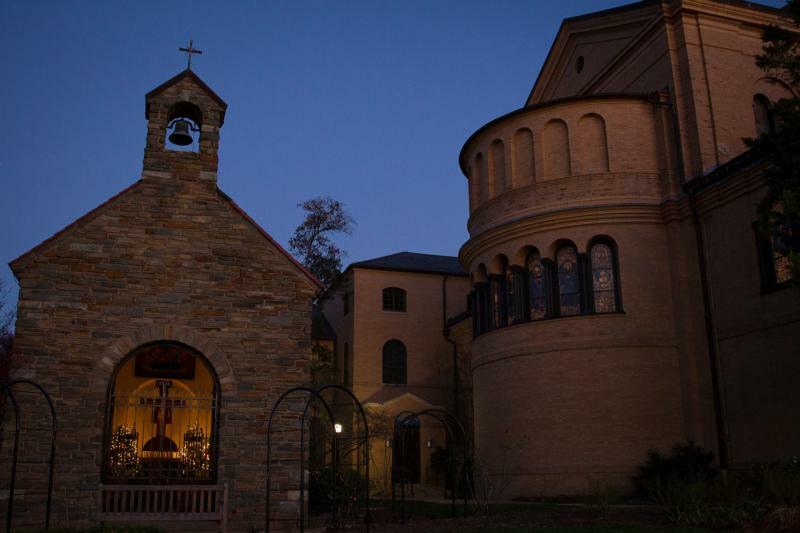 The monastery, high on one of the few hills in the nation’s capital, is a perfect place for those who can’t make it to the Holy Land to witness the real thing, said Franciscan Father Greg Friedman, a friar at the monastery who also is a frequent visitor to the Holy Land and has led pilgrimages there on many occasions. 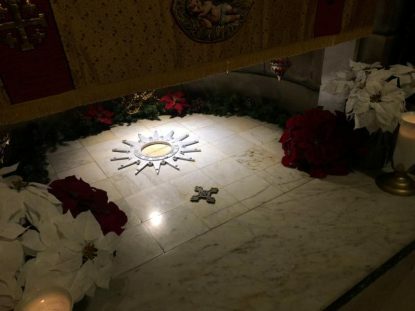 Walk toward the Bethlehem grotto at Washington’s monastery and near the manger you’ll find a 14-point silver star with the words “Hic de Virgine Maria Jesus Christus natus est” (“Here Jesus Christ was born to the Virgin Mary”), a direct copy of the one pilgrims touch in Bethlehem. Part of the mission of the monastery is to provide an opportunity to pilgrims, and others, to physically see the places important in the life of Jesus in case they’re not able to make it to the Middle East. That experience includes seeing the place in the West Bank where many believe Christ was born. But Christmas also gives the Holy Land Franciscans a chance to put on display part of their spiritual heritage, which includes the Christmas-time practice of decorating creches, an activity first attributed to St. Francis of Assisi, the founder of the Franciscans. This year, the monastery has a display of over 100 creches from the Roger and Marguerite Sullivan collection. In the past few years, the Franciscans in Washington have made the effort to involve the area’s immigrant community, which has helped them diversify their Christmastime activities. They now include Simbang Gabi, a Filipino Christmas tradition that begins with series of nine pre-dawn Masses in preparation for Christmas, as part of their celebrations. They also have added a popular feature by including three immigrant women who worked as midwives in their native countries to join the friars in a procession before and after Christmas Eve Mass. The women dress in the vibrant clothing traditional to their home countries, which contrasts with the toned-down brown hues of the Franciscans’ habits. “People love it. It’s better than the Three Wise Men,” said Father Jim Gardiner, a Franciscan Friar of the Atonement, who has celebrated some of the Christmas Eve Masses at the monastery in the past and will do so again in 2018. One of the women, the one named Mary, has carried the baby Jesus around the interior of the monastery’s main church dotted with replicas of places important to Christianity, including Calvary, the tomb of Jesus, and the underground Bethlehem grotto, where the baby Jesus figure is set to rest on top of the hay following midnight Mass. “Why would I walk around the church with a replica of the baby?” when there’s a Mary in the house, said Father Gardiner. The women set the baby Jesus in front of the altar during Mass. He then gets picked up at the end of Mass and is taken to the grotto as the Proclamation of the Birth of Christ is read. “It would replicate what happens (in the Holy Land) but with a little twist,” said Father Gardiner. And it ends with the joy that the Franciscans hope will make others discover the true meaning of Christmas, which has nothing to do with material gifts. “As I hear the Christmas story retold there, I am challenged to allow God to be reborn in my own life, with all the implications of that birth. Everything we do here at Christmas brings that back, brings it to life for me,” Father Friedman said.